President of Ecuador Lenin Moreno visited the UK in mid July amidst speculation that he was going to terminate Julian Assange’s political asylum and eminently hand the WikiLeaks publisher to the UK police. Further reports emerged that UK government authorised the Metropolitan Police to use lethal force in the apprehension of Julian Assange. A solidarity vigil was called on Monday the 23rd of July to once again remind people how the UK government must stop the flagrant violation of Julian Assange’s Human Rights, free and compensate him, offer safe passage to leave the UK. We chanted against the extradition of Julian Assange to the USA, where a Grand Jury Investigation awaits to indict him on Espionage related charges. 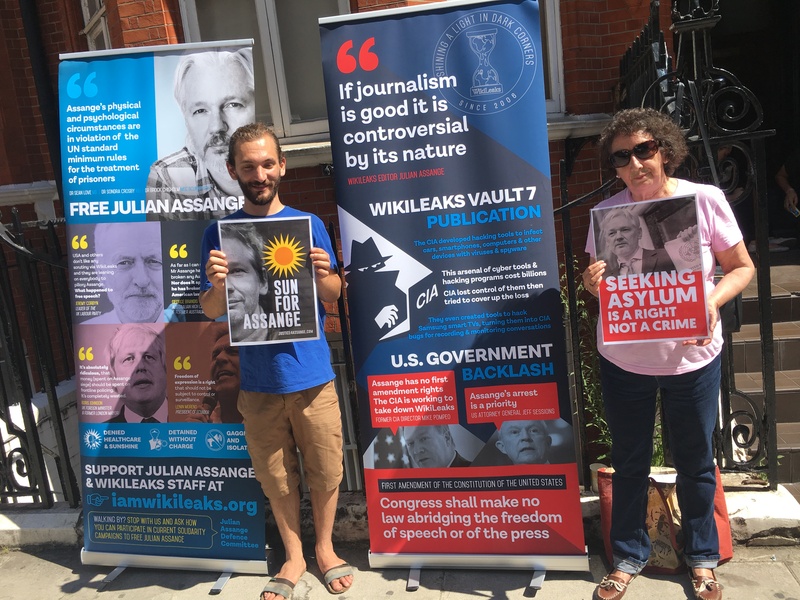 The solidarity action was covered by Paul Mitchell from www.wsws.com urging its readers to Defend Julian Assange and Mobilise to Protect the WikiLeaks founder. 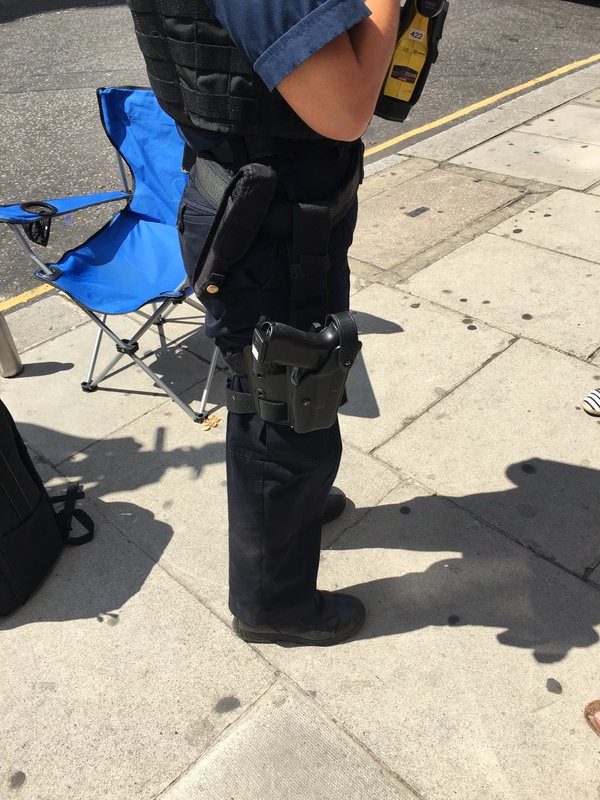 Two members of the Diplomatic Protection Unit of the Metropolitan police approached the solidarity vigil asking question about who organised the event and whether it was going to last all day. Journalists from Ruptly and CNN were also present recording footage outside the Embassy. A letter to the London Assembly was read out challenging London Mayor Sadiq Khan’s reports that the London has spent GBP 13.2 million on keeping Julian Assange trapped in the Ecuadorian Embassy, demanding more transparency on the matter. It further Requests to confirm that the use of lethal force against Julian Assange is not the legacy he wishes to aspire to. The same evening between 16:30-18:00 a group of Ecuadorian citizens staged a protest against their President Lenin Moreno outside Intercontinental Hotel where he was staying making their message to him clear, berated him for the betrayal to Ecuadorian people, chanting “Free Assange”. Here is the Presidential motorcade leaving the Hotel to attend a reception at the Global Disability Summit at Queen Elizabeth Park. The following morning at the Global Disability Summit itself a different group of Ecuadorians gathered outside at Here East Press Centre at Queen Elizabeth Park to protest Lenin Moreno’s participation and betrayal of Human Rights in Ecuador as well as the treatment of Julian Assange. The protest in London against Ecuadorian President Moreno’s persecution of Julian Assange was covered by reporters of wsws website, where you will read Mayra highlighting that “Julian Assange is an innocent person and freedom of speech must be respected.” whilst Clara discussed the latest smears in Ecuador against the WikiLeaks editor saying: “And they have been helped by the Guardian. They [Ecuador] have this man called Fernando Villavicencio. One minute he’s a reporter, the next he isn’t. And he is giving the Ecuadorian government smears about Mr Assange. The Guardian’s attacks against Julian have been absolutely incredible—worse than any other paper.” RT and Telesur TV stations were also on site reporting and you can see some of their footage below. The day of protest against President Moreno continued later that afternoon by another group of Ecuadorians and Latin American people mixing with local WikiLeaks supporters at the Julian Assange solidarity vigil. Telesur broadcasting to Quito and RT in Spanish covered the event. Clara spoke to Sputnik about Julian Assange’s current situation. In the meanwhile Catholic Worker Ciaron O’Reilly has been camping outside the Ecuadorian Embassy since Saturday 21st of July in support of Julian Assange, watch below as he updates us. Many Thanks to Joe Public for the video. 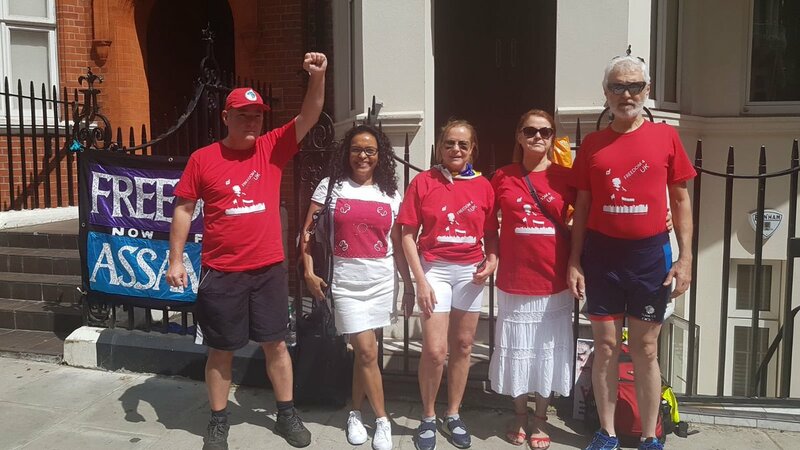 Whilst solidarity is growing amongst the “Freedom for Lula UK” London grassroots solidarity. 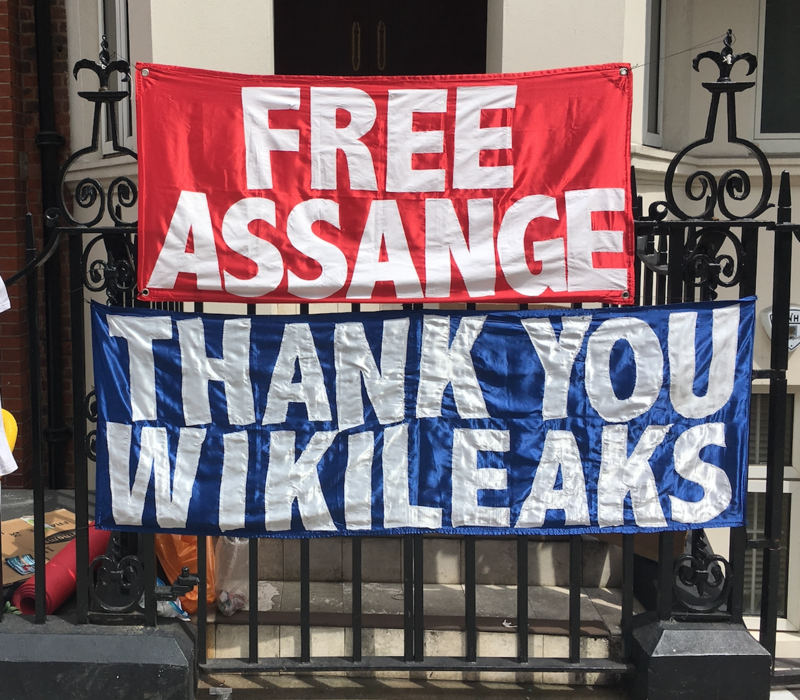 Join the Regular Vigil Outside the Ecuadorian Embassy in London Tue-Wed-Thu 3-5pm alternatively support the 24/7 vigil currently performed by Ciaron O’Reilly daily at Hans Crescent. Don’t forget our upcoming action on the 16th of August 2018, commemorating 6 years from the day Ecuador granted political asylum six years ago. Gallery | This entry was posted in Assange, WikiLeaks and tagged Ecuador, Julian Assange, Lenin Moreno, WikiLeaks. Bookmark the permalink.